FREE ESTATE PLANNING ARTICLES, FULL-LENGTH VIDEOS AND BLOGS!! Since 1987 our focus has been on Estate Planning and Gift Tax Planning, Business Succession Planning, Charitable Planning, and the use of Life Insurance to further those purposes. We do not sell securities, manage money, take custody of funds, or act in any fiduciary capacity. We concentrate on Wealth Transfer and Life Insurance. We are serious people addressing serious problems. Take a moment to review our mission statement on the Bio page and the Why Work With Us page. You will understand the important role we can play in molding your family’s future. The Estate Planning and Gift Tax Planning, Life Insurance To Pay Estate Tax, and Life Insurance Services pages are loaded with valuable information. We also have pages devoted to the special needs of Farmers and Ranchers, Land Trusts and Conservation Easements, the intricacies of Business Succession Planning, and a page for Trustees and Fiduciaries trying to fulfill their responsibilities. After exploring all the pages, take advantage of our Free Estate Planning Articles and Concept Explanations. We wrote them with the layman in mind. Estate planning is about achieving goals. The estate tax is merely an obstacle to achieving your goals. We believe that you should be thinking dollars, not taxes. 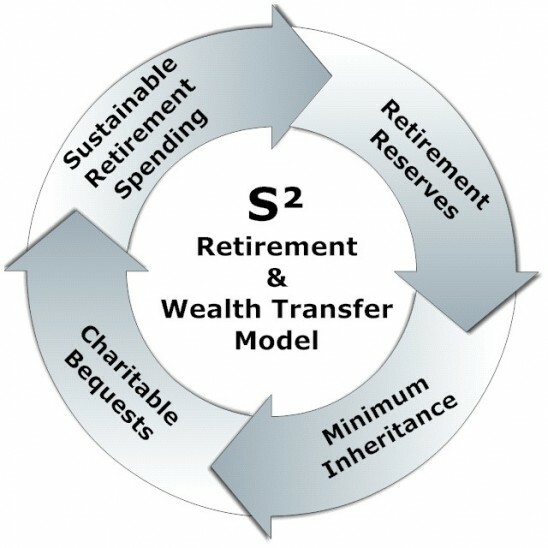 The S2 Model can allow you to maintain your financial security while alive and to leave a meaningful inheritance when you die. The S2 Model is a way of looking at things. It provides a perspective most people can understand. It focuses on goals and the dollars required to achieve those goals, rather than taxes. Visit our Estate Planning and Gift Tax Planning page to read more about the simplicity and practicality of the S2 Model. Wherever you are located, email us at info@ebsresponsiblewealth.com to arrange for a free consultation. Our common sense approach to estate planning and life insurance to pay estate tax will help you get to where you want to be. Pursuant to Internal Revenue Service Circular 230, we hereby inform you that any tax advice set forth herein with respect to U.S. federal tax issues was not intended or written by E. Brian Singer, Shaun Singer, EBS Group, EBS Responsible Wealth, or EBS Business & Investment Group, Inc., to be used, and cannot be used, by you or any taxpayer, for the purpose of avoiding any penalties that may be imposed on you or any other person under the Internal Revenue Code. Our role is to help you evaluate planning techniques that can reduce your future estate tax and gift tax, and increase the wealth transferred to your family. Brian Singer is not an attorney. Although he is a CPA (Inactive-California), it is not his intention to become your CPA. He no longer engages in the practice of public accounting. This and any other analysis or discussion is not meant to address all the issues and risks as you might find in a technical legal analysis. That task, if necessary, and if you are willing to pay the fee, is the responsibility of your attorney. Brian Singer attempts to take complicated tax principles and reduce them to understandable techniques for the layperson, in plain English. Any discussion and/or written analysis are meant to give you an overview of the anticipated benefits to be derived by employing specific techniques. Final responsibility for the tax aspects rests with the attorney of your choosing. All techniques require careful drafting by a highly competent tax attorney with specialized knowledge. A concept that might work when competently drafted, could fail as a result of mistakes made in the documents prepared by an attorney not proficient in these areas. The appreciation rates, investment earning rates, tax rates, valuation discounts, and other factors are hypothetical assumptions. The benefits from implementing any technique will ultimately be better or worse than described depending upon variation from the assumptions. There are no guaranteed results; either in an economic analysis or in application of the tax law. We hope you will decide to use our services. Any planning we propose is incidental to the purchase of insurance. Since insurance is used to pay estate tax, the less tax you will owe, the less insurance required. The planning is essential in the determination of your insurance needs. You are in no way obligated to purchase any insurance. If it makes sense for you, then buy it; if it doesn’t make sense for you, then don’t buy it. You are not expected to do anything that you feel is not in your best interest. We may choose to disengage at any time.